THEY have already been credited with helping reduce cholesterol. But it appears walnuts may help the body deal with stress and reduce blood pressure too. According to research, those with high levels of bad cholesterol had lower blood pressure in stressful situations when they had been on a diet rich in walnuts for three weeks. For the study, participants were asked to give a three-minute speech or immerse one foot in cold water - both of which are triggers for stress. Those with walnut in their diets had lower blood pressure, said Professor Sheila West, from Penn State university. 'This is the first study to show that walnuts reduce blood pressure during stress. 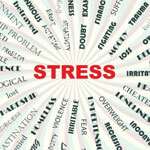 People who show an exaggerated biological response to stress are at higher risk of heart disease.' The team used three diets - one without nuts, one with walnuts and walnut oil and a third with walnuts and flaxseed oil. Adding flax oil did not affect blood pressure, but did help cre- ate an anti-inflammatory effect in arteries. This could reduce the risk of heart disease, the researchers say. After each diet, the 22 subjects were asked to take the speech and cold-water stress tests. Average diastolic blood pressure - the 'bottom number' which is the pressure in the arteries when the heart is resting - was significantly reduced for those on diets containing walnuts and walnut oil. Professor West, whose research was published in the Journal of the American College of Nutrition, added: 'These results are in agreement with several recent studies showing that walnuts can reduce cholesterol and blood pressure.